This is an audio summary and analysis of the book Mind to Matter by Dawson Church. Quickly learn how you can focus your own energy to physically alter the world around and within you and connect with a higher plane of existence. 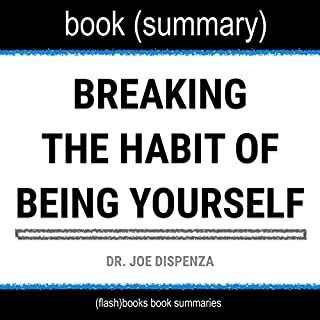 In Becoming Supernatural: How Common People are Doing the Uncommon, Dr. Joe Dispenza presents theories and science to educate the listener on ways they can change their thoughts, emotions, and energy to improve both their mental and physical health. Don't miss out on this ZIP Reads summary to understand how you, too, can transcend your daily problems and become supernatural. 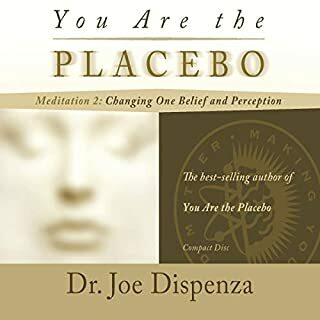 Dr. Joe Dispenza’s book Becoming Supernatural: How Common People are Doing the Uncommon is a blend of both scientific and metaphysical research describing and supporting his theories on meditation, removing stress, finding positivity, and creating dramatic changes in your own life. 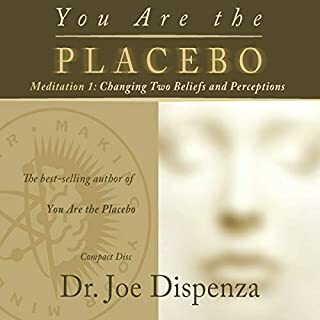 Dispenza informs the reader on the links between mindset and physical health, as well as how to improve both through his unique style of meditation. DISCLAIMER: This book is intended as a companion to, not a replacement for, Becoming Supernatural. ZIP Reads is wholly responsible for this content and is not associated with the original author in any way. If you'd like to purchase the original book, click here. I wonder WHO would like this. It's a reader review and critique of the book and not a crib note of understanding. Half of this Zip book is critique of his order and methods and lack of proof and undermining concepts. Very BIASED as opposed to a summary. Rediculous ongoing critique for 50% of his position, organization and philosophy. What three words best describe Lisa Negron’s voice? Soothing, direct and easy listening. 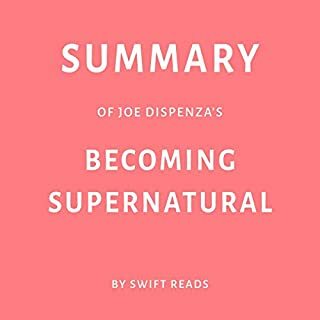 What character would you cut from Summary & Analysis of Becoming Supernatural: How Common People Are Doing the Uncommon | A Guide to the Book by Dr. Joe Dispenza? The entire critique - none of it was helpful. This is supposed to be a summary of the book and information not a critique of writing style and beliefs. The entire 2nd half of this ZipRead is critique and presented with a bias that is clearly against the theories and philosophy. Wanted a summary...not critique. Dont recommend. I'd really like my money back. 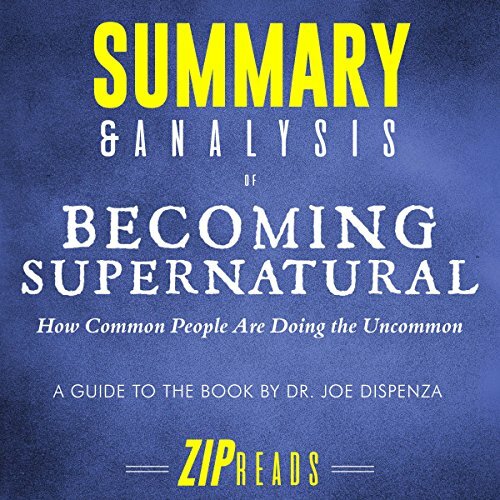 What disappointed you about Summary & Analysis of Becoming Supernatural: How Common People Are Doing the Uncommon | A Guide to the Book by Dr. Joe Dispenza? This is a contradictory critique that explains absolutely nothing about the techniques in the book. She says things like "many of his claims are unscientific" which some of them are undoubtedly lacking research. The thing is, Joe points this out immediately in the book. He clearly states that this book is focused on exciting hypotheses that work very well for a lot of people anecdotally and need further research. Then she goes on to say "many of his claims are too scientific (referring to the legitimate biofeedback research on HRV and alpha brainwave states), it's too complicated for the average self help reader"...what?? I'm really glad I decided to read the book in its entirety. The meditations are terrific, the hypotheses are exciting, and the research is promising, though in need of a variety of controlled studies. I should have meditated before writing this review lol, because my blood is boiling a little. This Zip Read may ultimately turn people away from a very valuable resource. In just two weeks my stress levels are noticeably down and my mood in general is much brighter. It remains to be seen how the meditations improve my physical health, wealth, and performance but feeling better is a nice start. 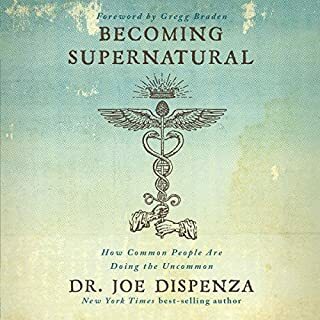 Has Summary & Analysis of Becoming Supernatural: How Common People Are Doing the Uncommon | A Guide to the Book by Dr. Joe Dispenza turned you off from other books in this genre? Yes. I will never listen to a Zip version again. Was hoping to have this as a summary reminder to revisit as the actual book is a weighty tome. Would you be willing to try another one of Lisa Negron’s performances? Absolutely not she sounds like a robot. It's a computer voice reading a sophomoric book report.about what is probably a really good book. A good overview of the content & helpful critique. A good description of the valuable content and criticism of the way it was written. I could not listen to this AI voice. I really wanted to listen to this but it is not a human reading this. it's an AI voice. they say it is narrated by a human and list a name. bit this is no way a real human reading. it's terrible. So I have no idea how the content was done because I cannot listen to,AI voices. what a rip off and then to say it's narrated by someone is deceiving! Summaries are good, if clinical. The analysis part feels a bit cynical - I have read and attended much of Dispenza’s work and this analysis doesn’t seem to capture the essence for me. The narration style makes it harder to engage with the content - she doesn’t have enough of a feel for the material; inflections and emphases are too frequently in the wrong places. I will be deleting this title from my collection. I can't imagine who could endure this narration. It's obviously not read by a human. That they couldn't just pay a human to read it! And that it's NOT a condensed version of the book. Irritation. I just can't get past the bot so this is not a comment on the content. not a summary but an opinion of writing style. completely dissapointed with this summary. Instead of brief explanation of chapters, this summary was focused on writing style, what could have done better in terms of explanations in the book, etc. What a shame, this important work is quite ruined by the awful robotic voice and resultant nonsensical phrasing, which makes it difficult to follow the thread of what's being said. Really annoying. 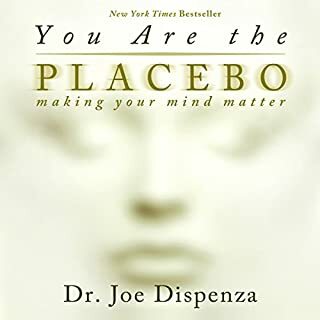 I was still able to get some benefit from the overview of Dr Dispenza's work, but this audiobook needs to be redone. Not what it implied it was. Not only did it give the book a bad review, they started talking about other books you should read instead! Very disappointed. More of an opinion piece than a narrative summary! Seems to be written by someone with no grasp of the content... one would think a summary would be written by someone with at least a bit of knowledge of the area?